With the last couple of months flying by, what was meant to be the April/May blog has now become the late spring blog! With April comes heavy herd health season for us at McKee Pownall, and one of the main times of the year that we go get to see horses who are healthy! We generally have scheduled appointments that are unhurried, and relatively low stress time to catch up with you on how your horses are doing. It’s a great time to touch base on how you and your horses got through the winter, to check on ACTH (Cushings) or insulin resistance (Equine metabolic syndrome) markers, to pull your geriatric or yearly blood profiles, and even get your coggins test done going into show season. We really do look at these appointments as a time to make a plan as to how to keep your horse healthy, happy and sound coming into to the main riding season. For future reference, if you would like to add a performance exam, time to talk about summer performance or geriatric horses’ needs, please make sure you let the girls in the office know when you call to make your appointment so that we make sure we have enough time to chat and look at anything that may have developed over the winter months. Fall vaccination is not too far around the corner, so keep these things in mind if you are looking forward to fall check ups and winter show season as well. In May, things really started to pick up in terms of performance and lameness. Palgrave started, and that gave us a whole lot to do! The May long weekend seems like a very long time ago now, and the last month has been a blur of performance medicine and lameness, breeding, and emergencies. It seems impossible that now it’s the beginning of July, and we are in high “horse vetting” season! All in all, it’s been a great couple of months. Although I could have done with a few fewer difficult emergencies, its been nice to see you all, and it is so nice to see you all settling in to tackling your summer horse goals. As promised, I am going to share one more wound case with you this month. 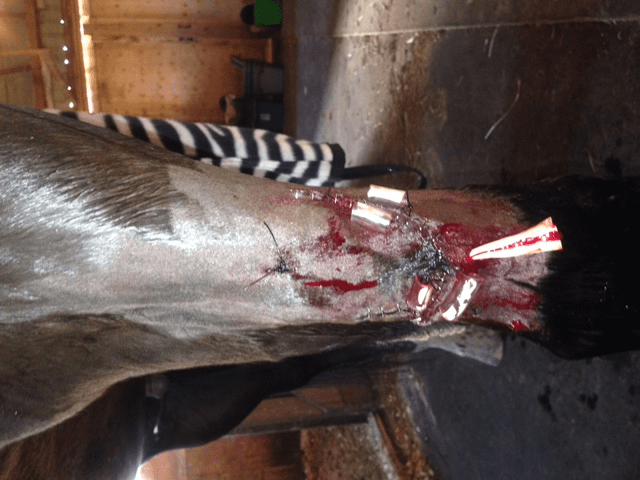 As we head into spring, people start riding more, horses start to feel good, or have herd changes and start kicking up their heels – with all of that can come injuries, and so I think it’s a good time to review managing wounds. So we’re going to do a little case based work to emphasize a few points. I was called a few months ago to see this horse who got to fighting with his turnout buddy. One good kick and the owner was presented with this! As you can see, this is a pretty yucky wound, and the owner was quite concerned with the amount of bleeding and the depth of the wound – as she should have been! This is not a “wait and see” wound. From the vet perspective, the trouble with this wound is that it is deep. It is on the radius – a common site for a kick (above the horse knee). You can actually see exposed bone in the deepest part of this wound with no soft tissue over top. The ligament and musculature structures are traumatized, and the bottom of the wound approaches the carpal (knee joint), and though it isn’t an old wound, the skin over it has already retracted significantly, and the skin layer is very thin. Overall, quite a few challenges to deal with – and a “school horse budget” to keep to. First we assessed the carpal joint and distended it with sterile fluid to see if any of the fluid we injected into the joint leaked out of the hole. We do this to assess whether the joint has been involved – because if it has, the wounds severity and how we need to deal with it changes significantly. We were lucky and had no fluid from the wound! First good news since seeing this wound. Next we had to make some decisions so we clip, clean and explore the wound with sterile fingers and probes to assess the depth of any dissecting tracts (dissecting tracts are areas that would normally be held together by connective tissue but with the trauma, the connective tissue has separated leaving an empty space where fluid loves to accumulate, create seromas and lead to infection). Because of the nature of the flap being so thin it will be difficult to pull it over the wound, and because its blood supply is poor, it will have a good chance of dying. Perhaps you ask “So why not just cut it off????!! !” Good Question! The answer is that pesky piece of exposed bone. Bone and air do not mix. Fortunately, this horse did not suffer a fracture with his kick, but exposed, traumatized bone is always a problem. There is a very high likelihood of a deep bone bruise (which compromises circulation), the risk of disrupted periosteum (the thin membrane layer on the outer surface of our bones) and risk of dirt and bacteria being kicked right onto it. With that combination the potential for infection of a very large, very important bone in the horse is high. Infection can lead to sequestrum formation (a piece of bone which is separated from the parent bone by either trauma or infection which can either re-attach to the parent bone or the body will start to attack it as if it were a foreign body trying to expel it! ), delayed wound healing and even catastrophic bone failure. So, we know going into the wound repair that even if we stitch this wound, that it may pull apart from the tension on the flap and the flap may die and later have to be cut off, we suture it anyway – because putting live tissue over bone is the best bandage we can offer. So, we lavage the wound heavily with sterile saline, and placed a drain in the dissecting tract. We then close the deep tissue layers over the bone and then with the use of “pulley” sutures and stents we stretch that piece of skin over the wound and place a pressure bandage. We treat aggressively with antibiotics and …………………………make a wish. This was a troublesome wound in the end. I did see it multiple times but we taught the owner to do full limb stack/pressure wrap and she texted pictures of the bandage change daily. The drain helped keep the flap close to the skin, and prevented pooling of fluid early on. We radiographed the bone on the day we went back to remove the first stage of sutures (no bone infection! no sequestrum forming!) and continued on with bandaging and cleaning. Part of the flap adhered normally to the underlying tissues and part of it died (it was pulled apart by the tension on it), but it had achieved its purpose of getting a layer of healthy tissue grown over the bone again. We later debrided the wound, and used manuka honey on it until the granulation bed closed. (Recent studies show that manuka is effective in fighting some infection and promoting wound healing, though the research in horses is somewhat variable, anecdotally, equine veterinarians have been having good results from its use on wounds and granulation beds). Overall, we are thrilled with this overall outcome of this wound, despite the hiccups. It took a lot of time, and effort on the owners’ part, but he recovered fully and is currently in prep for show season. Call early: Seeing this wound early (within hours of it happening) allowed us to initiate treatment early, and gave us the best possible chance for a good closure. Know what you are dealing with: a good assessment allowed us to know what we were up against, and allowed us to choose the best way to forge ahead. It also allowed us to prioritize our budget and make the most of our dollars. If there had been a fracture, or if the joint had been involved, we would have had to prioritize differently. Most importantly it allows us to prognosticate (give a good estimate of expected outcome), and predict and attempt to prevent possible pitfalls before they occur. The owner’s diligence made all of the difference in the total outcome: She was careful and followed directions very well, reporting anything that seemed out of line immediately. This horse didn’t need a vet to see him every day, he needed a good bandage, great wound care, antibiotics and to have his temperature monitored closely. Because the owner could offer all of this nursing care, she was able to keep the budget on the overall treatment low, without compromising in care. Not every wound heals perfectly: despite out best efforts to manage them, wound repairs sometimes fail. It is as frustrating for us, the veterinarians, as it can be for the owners and the horses. However, in this case, because the client was quick to relay changes to us, we were able to adjust the plan to keep progressing in a net positive direction despite the many challenges this wound presented us. Though they sometimes take longer than we like, we are always happier with a good overall outcome. We would like to thanks Princeton and Eagle Wing Ranch for letting us share their story with you all!